Note: The version of the dataset is now V4.0.1. The dataset used to be knows as the MLOST dataset. Monthly gridded anomalies of air temperature from the GHCN-M and the NOAA ERSST V4 dataset. 5.0 degree latitude x 5.0 degree longitude global grid (72x36). The NOAA Global Surface Temperature Dataset (NOAAGlobalTemp) is a merged land–ocean surface temperature analysis (formerly known as MLOST) (link is external). It is a spatially gridded (5° × 5°) global surface temperature dataset, with monthly resolution from January 1880 to present. We combine a global sea surface (water) temperature (SST) dataset with a global land surface air temperature dataset into this merged dataset of both the Earth’s land and ocean surface temperatures. The SST dataset is the Extended Reconstructed Sea Surface Temperature (ERSST) version 4.0. The land surface air temperature dataset is similar to ERSST but uses data from the Global Historical Climatology Network Monthly (GHCN-M) database, version 3.3.0. 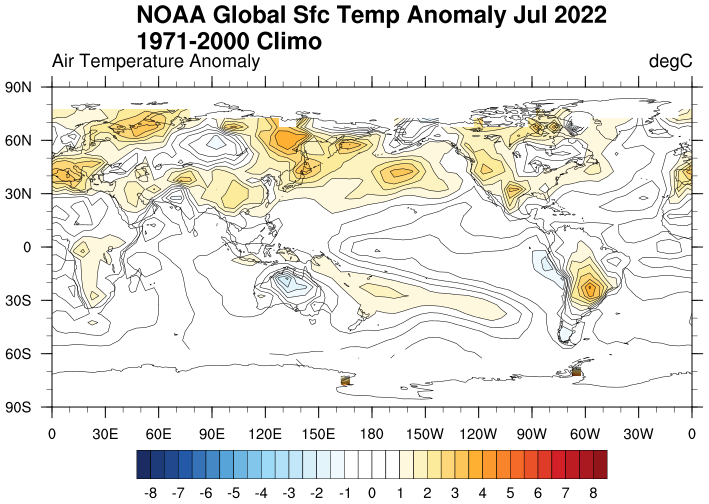 We provide the NOAAGlobalTemp dataset as temperature anomalies, relative to a 1971–2000 monthly climatology, following the World Meteorological Organization convention. This is the dataset NOAA uses for global temperature monitoring. Older data changes slightly each month, particularly near the present so you shouel note the date the file was obtained (in the file metadata). PSD standard NetCDF ~16 Mbyte file for each monthly file. Please note: If you acquire NOAA Global Surface Temperature (NOAAGlobalTemp) data products from PSD, we ask that you acknowledge us in your use of the data. This may be done by including text such as NOAA Global Surface Temperature (NOAAGlobalTemp) data provided by the NOAA/OAR/ESRL PSD, Boulder, Colorado, USA, from their Web site at https://www.esrl.noaa.gov/psd/ in any documents or publications using these data. We would also appreciate receiving a copy of the relevant publications. This will help PSD to justify keeping the NOAA Global Surface Temperature (NOAAGlobalTemp) data set freely available online in the future. Thank you! Vose, R.S., D. Arndt, V.F. Banzon, D.R. Easterling, B. Gleason, B. Huang, E. Kearns, J.H. Lawrimore, M.J. Menne, T.C. Peterson, R.W. Reynolds, T.M. Smith, C.N. Williams, Jr., and D.L. Wuertz, 2012: NOAA's merged land-ocean surface temperature analysis. Bulletin of the American Meteorological Society, 93, 1677–1685, doi:10.1175/BAMS-D-11-00241.1.